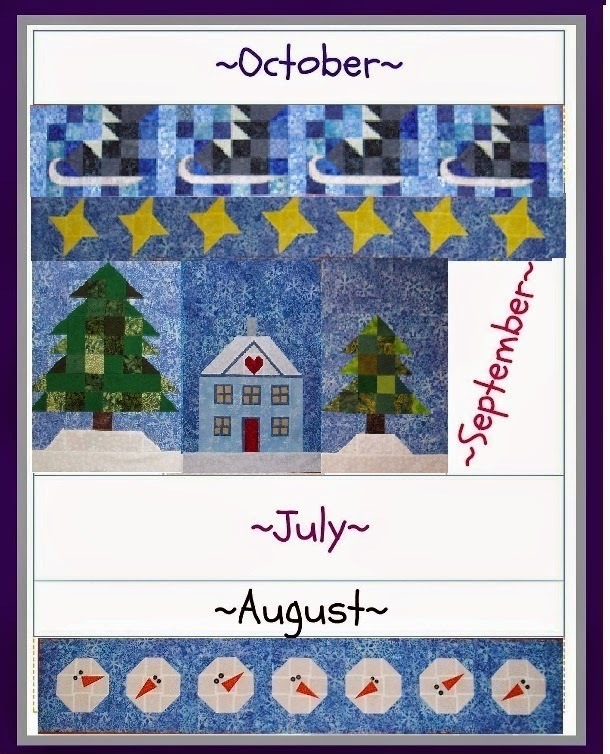 This was a very fun BOM QAL in 2014 by Cindy at Quilt Doodle Doodle. Cindy is going to have a blog hop on January 24- 26th to showcase the 2014 QAL. I got motivated to finished mine up! Cindy is hosting another QAL for 2015. The block of the month is free during each month. 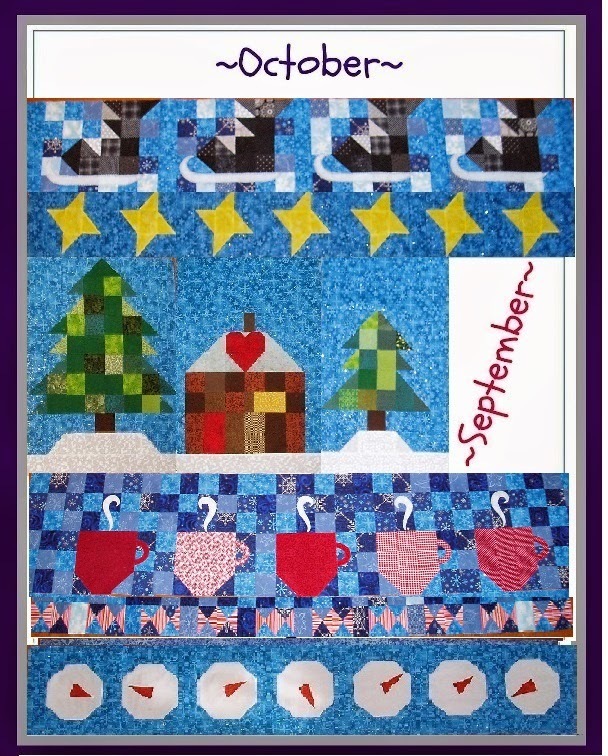 I was so excited on the 1st of each month to rush to Cindy' blog to see what the new quilt block(s) would be. Month by month, progress was made. As each section was completed, it was exciting to lay them together to see how it was going to look. All so cute, but isn't the bright colored lights row fabulous? You can see I started getting a little scrappy due to making sure I didn't run out of that blue glitter fabric and also to break it up a bit. 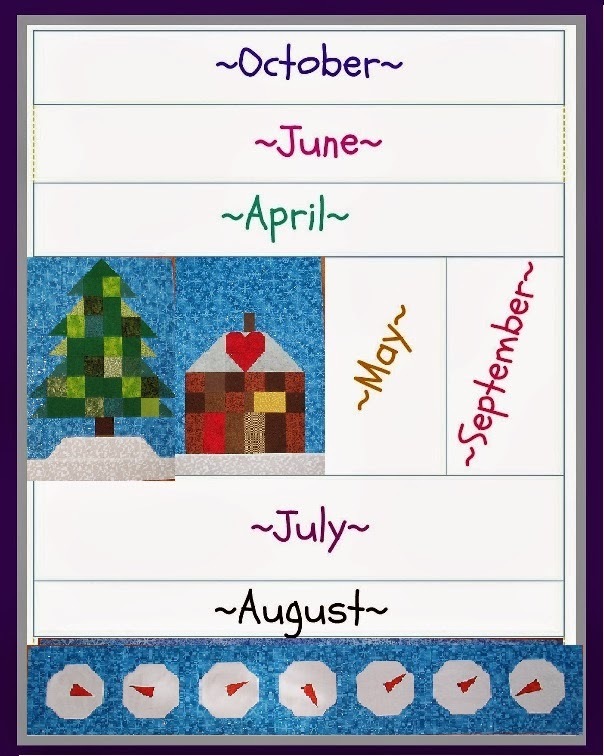 I did a loose loop quilting design to keep it softer and the house got a little special FMQ with some roof shingles, siding, feathers in the heart on the roof, and some embroidered details with a Christmas tree in the window and some outlining on the door, the window, and the heart. I decided to follow suit and used 100% polyester batting. I can already tell it will be warmer. It sure was a fun quilt along, but I'm not done since I started another one along the way! I'll have to get back to this batik version soon. Linking up at Crazy Mom Quilts. what a nice quilt, I really like your FMQ as well. I'm always afraid of running out of fabric too. Your QDD quilt is beautiful. I made it also, but it isn't quilted yet. Love what you did with yours, and the second one as well. Also love your cat pillows; too cute. Absolutely adorable. Love the steam coming off the cups of cocoa. Your quilting was perfect too! What a gorgeous finish, Sheri! I just love your version! I am chuckling about your worrying about running out of the blue glitter fabric! But your scrappy touches are just perfect, as is your quilting!